Even though I am trying to be a good patient and wear my splints all the time, it just isn’t possible. I am still limping around, too, so I am not doing much hiking as my knee still hurts from the fall. Rather, I am on the patio in the warm afternoon sun, away from those dangerous dogs! I had a few pictures, a bit of imagination, and some watercolor pencils. I decided to try them out in some rather different ways to learn how to better use them. 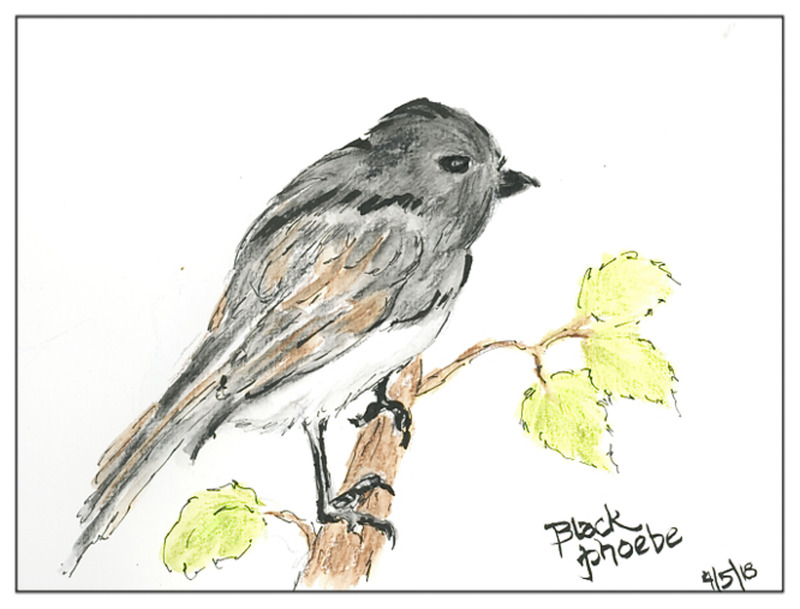 Above is a Black Phoebe. They live in the trees around here. Their feathers are darker om the head, and their faces are not quite so fat. I tried to get in line detail and then used a fine brush. Darkest blacks were from an ink brush. 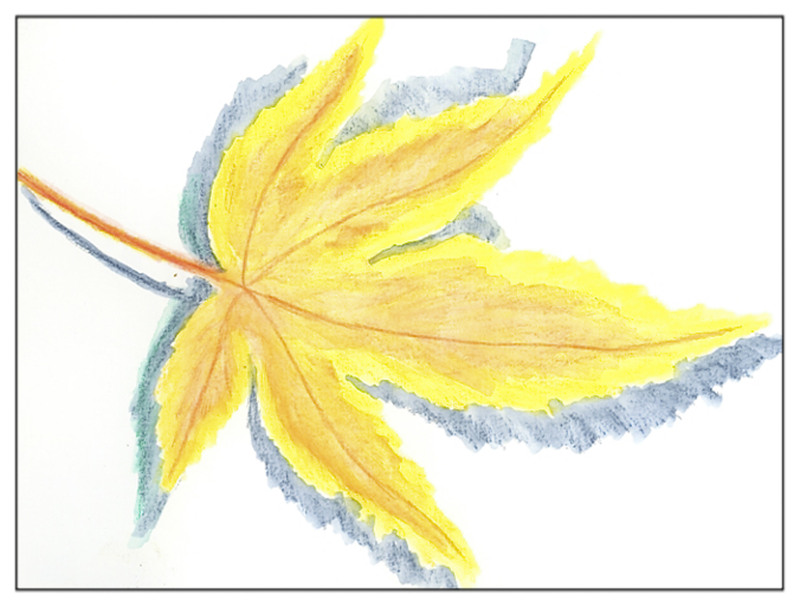 Next, just a simple Japanese maple leaf, no lines, only pencil and water. I laid it on pretty thick, but it is still paler than what I would like to see. 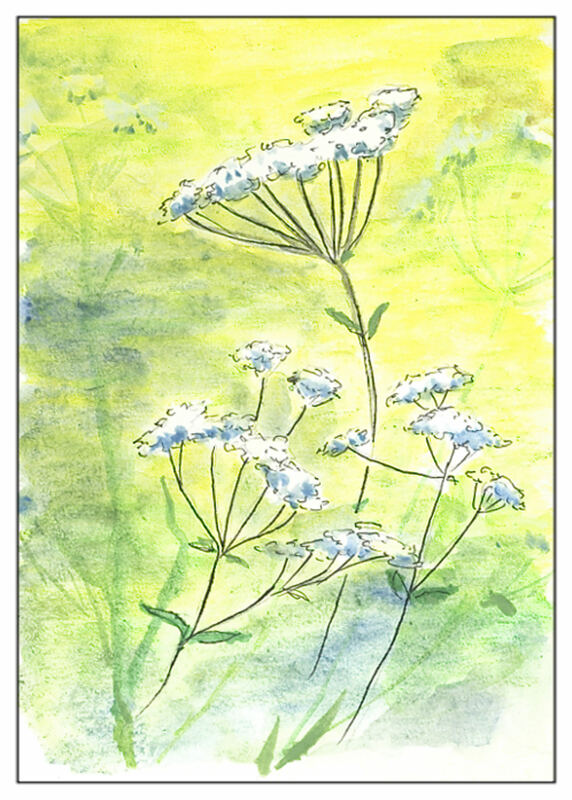 Finally, Queen Anne’s Lace. Here I wanted to draw into negative space, so what better subject than white flowers? I used ink, and for the paler flowers in the background, I dipped my brush in water and took color off the pencil tips before painting onto the paper.